Ok! So now just a slight adaptation of the post below. 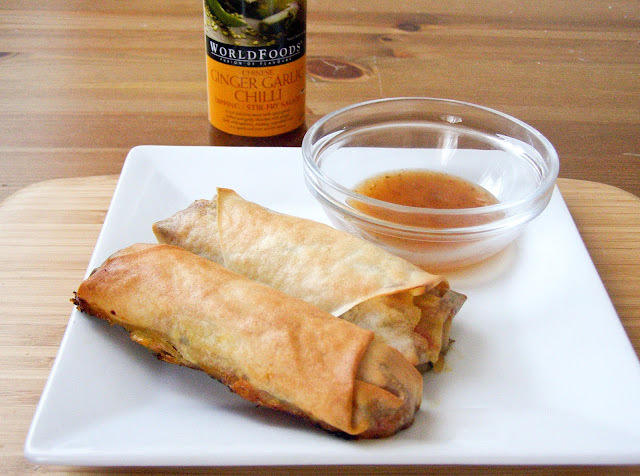 I know a lot of you might not be too keen on deep frying and I do like to please all here ;) So if you hate the fake meats, make the veggie spring rolls, deep frying fill you with fear? Oven bake them!! There's something for everyone here! Seriously though, these were just as good. Yes, I actually said that, oven baked were just as yummy as deep frying and lets face it, bags healthier. They crisped up nicely and stayed nice and light, not to mention they were a lot easier to make. First, I tried the spring rolls oven baked and had no problems aside from not cooking off my mixture long enough and not waiting for them to cool, this resulted in water pouring out of a couple spring rolls. Just make sure you cook the mixture off well and let it cool - I was impatient! I preheated the oven to 220C and brushed a little peanut oil over them, placed them on a baking paper lined baking sheet and cooked them for about 15 - 20min. They were golden and light and crunchy - perfect. Second I tried oven baking the wontons using the 'Shanghai' wrappers from the post below. I didn't take a photo of these as I did this in the evening but they turned out just fine. Again, nice and crunchy and golden brown. Slightly more chewy than when they were deep fried but good nonetheless. Then I wanted to try the wontons using the spring roll wrappers cut into squares. I took 1 sheet of spring roll wrapper and cut it into four equal squares then proceeded to make wontons with them BUT it didn't work. I don't know if they were too thin or if my sheets were getting a bit dry and old at this stage but they would not come together and just split open. As I already had the little squares cut I just decided to make mini wonton rolls. 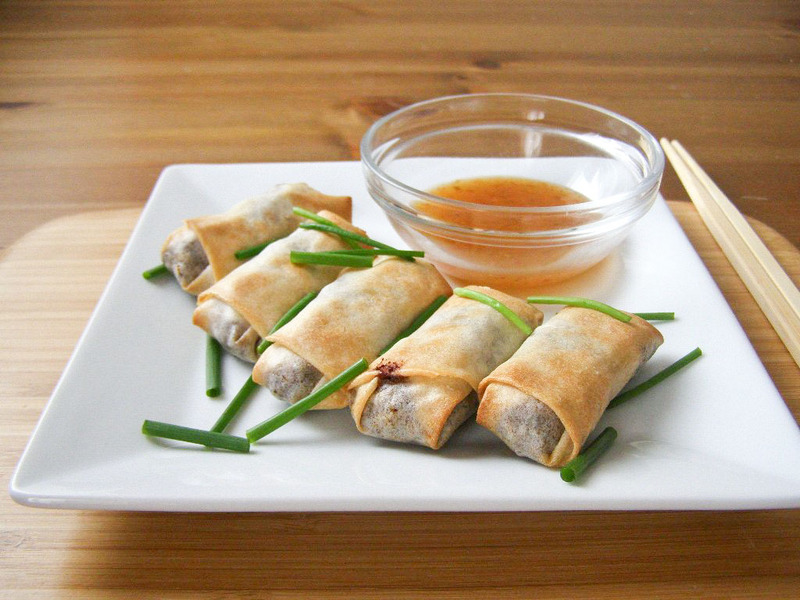 These rolled up just fine - using the same procedure for the veggie spring rolls and I have to say have been my absolute favourite out of all of these. Oven baked they were light and crisp and are just the right size for the type of filling they have - you wouldn't want them bigger, and taste fantastic. 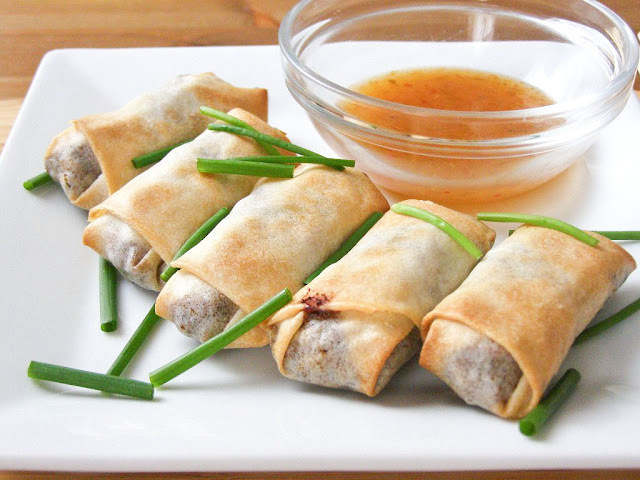 I think they would make great party food and you could easily make the veggie rolls mini like this too. Again, just brush with a little peanut oil and bake in a 220C oven for 15 minutes. I also wanted to blog about this sauce I found at Tesco. It's labelled vegan and is bloody fantastic! 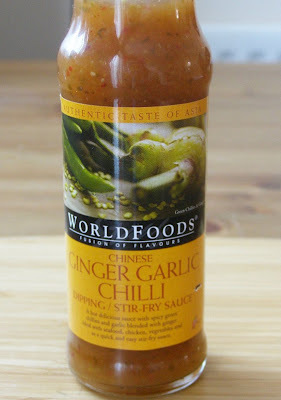 It tastes much like Thai Sweet Chilli sauce but with, you guessed it, more garlic and ginger. It goes perfectly with both the veggie and soya mince fillings - lovely! Those look delicious, and healthyish too! I'm loving the new look of your blog. I have posted an award for you on my blog. Thank you for all the "sunshine" you send my way!